It’s was Lunar New Year this weekend AND the start of the 2nd week of the Winter Olympics in PyeongChang, South Korea, so naturally we have Korean food on the brain. One of the most important foods for the Lunar New Year – called Seollal in Korea – is Yaksik. Yaksik is a sweet rice dessert studded with jujubes, honey and chestnuts. Not only is the dessert tasty, but it is touted for its medicinal properties. The name “Yaksik” translates to “medicinal food,” (“Yak” meaning medicine, “Sik” meaning food). Think of it as a fruitier, healthier version of rice pudding. Here are recipes for Yaksik from Kimchimari (seen below) and Maangchi. This year, Lunar New Year falls on a Friday! If you will be celebrating Lunar New Year in Korea the festivities are called Seollal, and you can expect a crazy amount of food and festivities. We covered one of the most traditional Seollal dishes previously on ETW, tteokguk (rice cake soup). However, that only scratches the surface. Most large Korean meals come with an assortment of small dishes called Banchan, and the Seollal table is no exception. However, to the uninitiated, the array of banchan presented alongside a meal can be overwhelming. Fortunately, the internet is brimming with banchan guides: Lucky Peach, Crazy Korean Cooking, Zen Kimchi, Thrillist and HuffPo, to name a few. Personally, my favorite banchan are japchae, radish kimchi and toasted seaweed. I love the concept that every meal comes with an additional portion of delicious, tiny dishes. Do you have a favorite banchan? Happy Lunar New Year! In the past I’ve highlighted some traditional dishes from around Asia, and now we’re on to Korea, where the Lunar New Year is called Seollal. Tteokguk (or ddukguk) – rice cake soup – is probably one of the most recognizable Seollal dishes. Eating a bowl of this soup symbolizes growing another year older, as well as wishes for a long, healthy life. The key to the soup are the tasty dumpling-like rice cakes (which can be found in other Korean dishes with variations like spicy sauce – ddukbokki). There are many variations on the soup, with different types of stock, so here a a few versions, from Crazy Korean Cooking, My Korean Eats and Chow Divine. February 8 is the start of the Lunar New Year, celebrated throughout Asia with festivals, merriment and – of course – good food. In Vietnam, Lunar New Year is called Tết, and this celebration comes with its share of unique tasty treats. One of the most emblematic Tết foods is the Bánh chưng sticky rice cake. These glutinous rice cakes, filled with beans and/or pork are wrapped in Phrynium leaves (or banana leaves if you don’t have those), and steamed. Banh Chung are eaten year-round, but they are considered to be a particularly essential part of the family altar on Tet. We were particularly interested by Banh Chung because, unlike many New Year dishes, these are savory rather than sweet. So how do you make your own? Danang Cuisine has an easy-to-follow recipe, and Viet World Kitchen has a step by step guide on how to properly wrap the leaves using a mold. Happy Lunar New Year! In China, today is the start of the year of the horse, and it’s time for delicious, celebratory treats as well. We’ve always loved the pretty Chinese cakes made in traditional wooden molds, like mooncakes. But the Red Tortoise Cake (In Hokkien dialect, “Ang Ku Kueh”: 紅龜粿) kicks it up another notch by being shaped like a turtle! 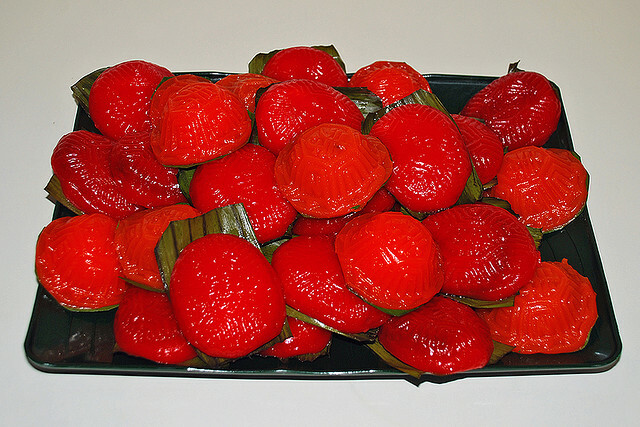 Red Tortoise Cake is filled with mung bean paste and covered with a skin of glutinous rice flour and sweet potato (colored red), then steamed on a banana leaf. 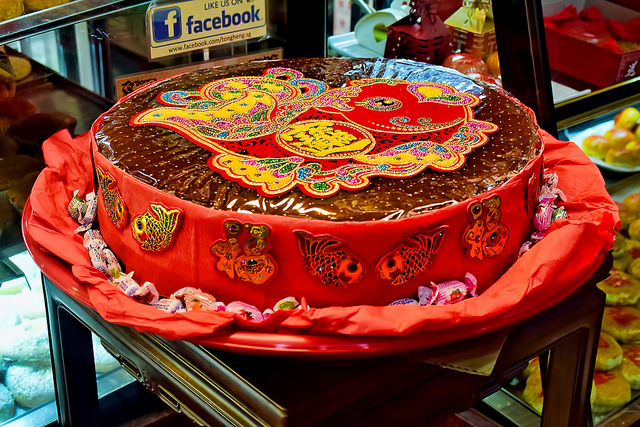 The turtle represents longevity, and auspicious cakes are popular for Lunar New Year, birthdays of elders, and to celebrate a baby’s first month. Due to this, you can find them year-round. Along with China, the cakes are also popular in areas with Hokkien-Chinese communities, like Singapore. You can get a turtle cake mold online, and try a recipe from Nasi Lemak Lover. Or perhaps you have your heart set on a tiny, clay rendition of a Tortoise Cake! Today is Lunar New Year – the welcoming the year of the snake. Fact of the day: Brazil has a substantial East Asian population, including the largest population of Japanese-descended persons outside Japan. São Paulo in particular is a major Japanese-Brazilian (nikkei) center, with Japanese cultural heritage on full display in São Paulo’s Liberdade neighborhood (which means “freedom” in Portuguese). Though originally settled by the Japanese, today the area is also home to many recent Chinese and Korean immigrants. Due to this, Liberdade is a great place to experience Lunar new year! In 2011, 200,000 people attended new years celebrations in Liberdade alone. Liberdade is a very cool place, marked by its distinctive red lamp posts and a red Japanese gate (torii) at the entrance to the main street. We visited Liberdade in 2012, right after new year, but the place was still hopping. The neighborhood is also famous for its weekend street fairs, which are full of food, and bring out Paulistanos from all areas of the city. On any day of the week you can get some of the best yakisoba , bubble tea and gyoza in Liberdade. In many other Brazilian cities, Japanese food is quite expensive, but Paulistanos have the pick of any range of restaurants. There is even a dedicated Sake shop! Happy New Year! Monday, Jan 23rd marks the start of the Lunar year – and the Chinese year of the Dragon. In Salvador, there actually are a few Chinese restaurants, so maybe we will be able to partake (we even saw a Macanese restaurant – cool!). 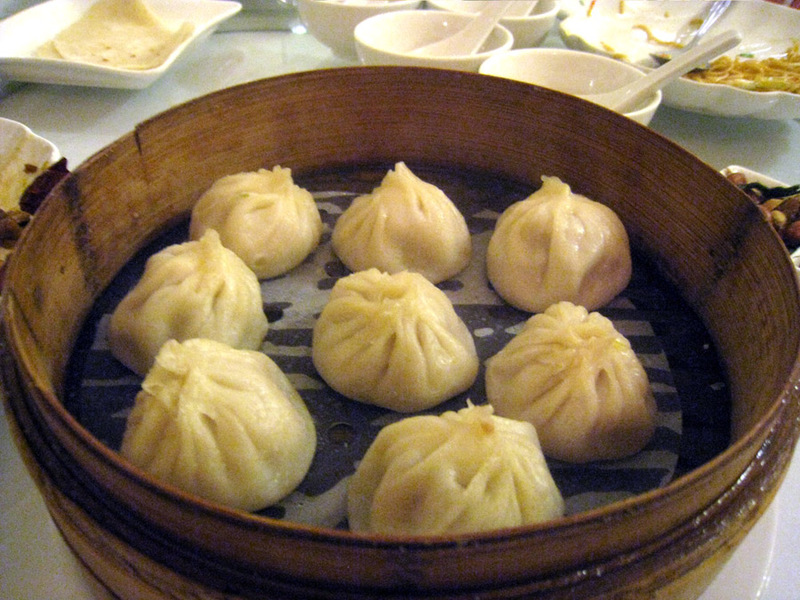 One Chinese food we are craving in honor of the new year is Xiao Long Bao (XLB). XLB are dumplings from Eastern China, which are filled with gelatin (which then melts to liquid through steaming), earning them the English nickname of soup dumplings. While we are admitted XLB novices, XLB have quite a cult following among foodies, and there are countless blog posts reviewing and critiquing dumpling offerings in America and abroad. Eating XLB is also an art unto itself, since the liquid filling of the XLB has the potential for explosion! January 26th marked the ushering in of the year of the Ox. As with any holiday worth celebrating, there is some awesome food involved in Chinese New Year celebrations. In honor of the new year here are some fun and delicious links. The BBC highlights a range of traditional regional Chinese New Years dishes. Epicurious takes on a transnational Lunar New Years menu. Philly chef Susanna Foo shares a story and some tasty recipes at Global Gourmet. And for the cheapskate – how to make some freestyle dumplings for less than 8 bucks.